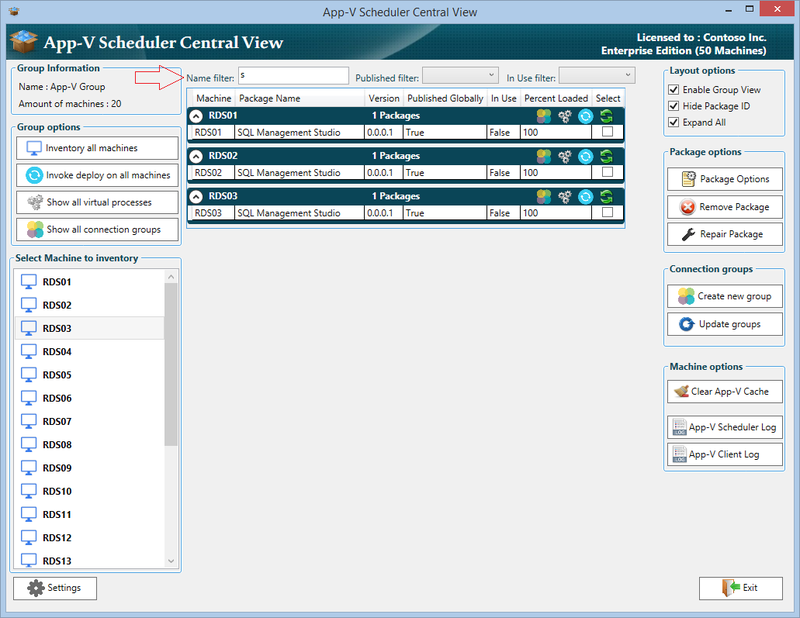 In short: the vision of App-V Scheduler is to reduce complexity and give you visibility and control over your App-V 5 deployment. If you want to learn more about the history of App-V Scheduler, please read more about the previous releases here and here. Today we are excited to announce the latest version of App-V Scheduler which adds a lot of new features and improvements, in this post we will walk through the new features in version 2.2. Here you can configure what should happen when the machine (re)boots, for example if the App-V cache should be cleared to always start with a fresh cache or if App-V Scheduler should detect the image state to see if the image is in read-only or read\write mode. The deploy cycle will always be triggered directly when the machine boots to make sure all packages are present when the users log in to the system. The application pre-launch functionality allows you to start selected (virtual) applications to improve the initial launch time of applications for the first users logging in to the system. You can now select certain directories from the content share which should be excluded by the deploy cycle, for example this allows you to archive your old package versions in a directory called archive. But this option is also very useful when you use multiple machine groups looking at the same content share. For example they can share the same folders with common packages and you can configure Machine group A to exclude Folder B and configure Machine group B to exclude Folder A. 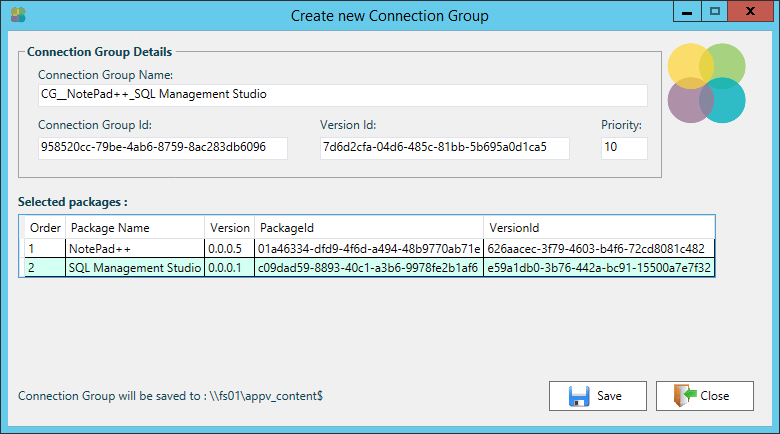 This allows you to create a very flexible App-V deployment structure. You can configure excluded directories in the general settings of App-V Scheduler (see the above service configuration screenshot). Besides timing information, App-V Scheduler logs every action in it’s own event log source in a very readable manner, this will not only make troubleshooting easy but also gives you a good understanding on how your App-V deployment is operating. After you created (sequenced) the package and want to make certain modifications to the package configuration when it gets deployed, you can make use of the deployment configuration file. We recommend to use the ACE utility from Virtual Engine which makes it very easy and transparent to modify the deployment configuration file. After you modified the file save it in the same folder as the package with the “Save as App-V Scheduler configuration file” option in ACE. 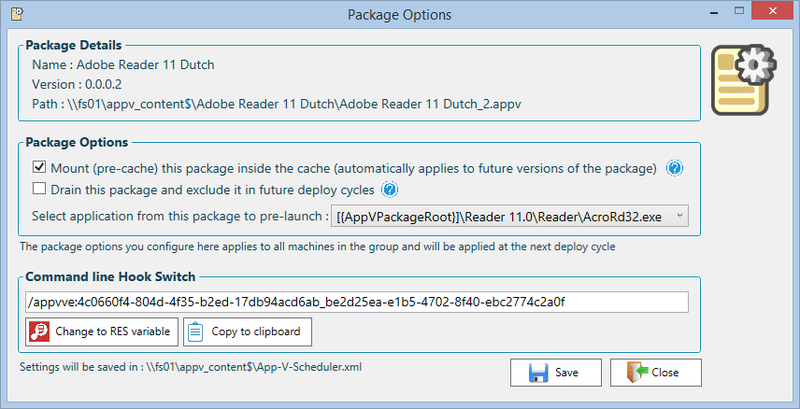 This will save the file with the .appd extension and App-V Scheduler will process the configuration automatically for you when the package is added to the machine. Now that the package is drained you can easily archive or move the package to another location, all by using only one click. This feature also allows integration with other products like AmberReef, which can automate the whole packaging, test and release workflow for you. For more information about this integration check out the better2gether video. You can also select and remove connection groups directly from here. 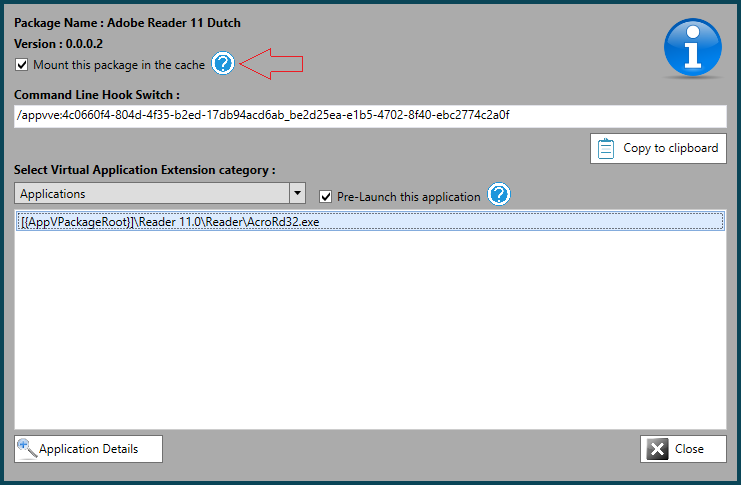 Here you can configure if the package should be fully mounted inside the cache, or if you want to drain and exclude the package. Also you can select an application entry from the package to pre-launch to make sure the virtual environment is already loaded one time before your users log in to the system improving the user experience. It also gives you a quick overview of the package details and access to the command line hook switch which you can use as parameter for native applications to run inside the virtual environment of the package. 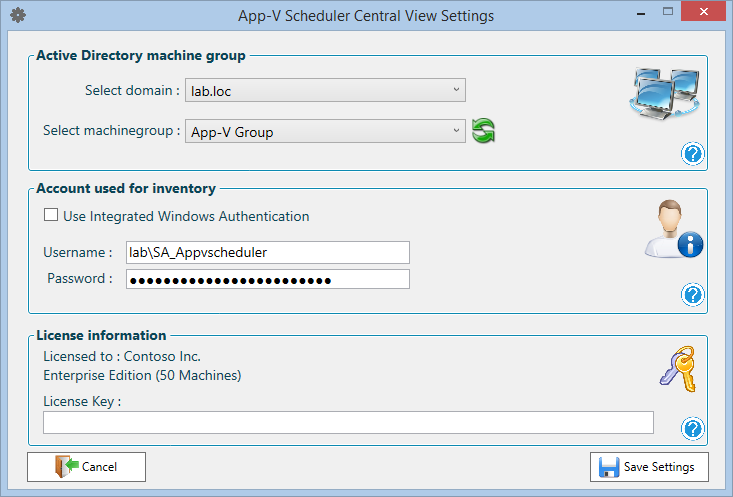 The following examples can give you some insight into how App-V Scheduler can be configured. This configurations are validated to work, but they are only intended to give you an idea of the possibilities. They can be used as guide line but are not written down here to serve as best practice or recommended configuration. 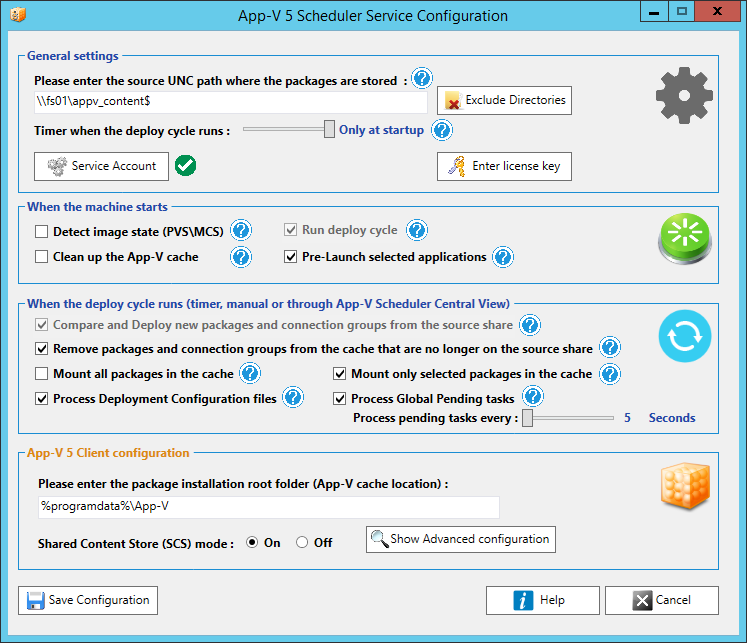 For more information about supported App-V 5 cache combinations with App-V Scheduler, please read the Administrator guide which is part of the download. New features are added frequently to App-V Scheduler and feature requests are always welcome! For the next release we are also adding user publishing support in App-V Scheduler. The current versions of App-V Scheduler are based on global deployment, this means the package is published on a machine level. When you use global publishing you need to manage application access for example with GPO’s or UEM tools just like they where installed natively on the machine. User publishing is also often used to control application access by only publishing an application to a group of users, this is a good way to separate application access if you don’t use UEM tools for example. App-V Scheduler will also support user publishing in combination with global publishing so you can get the best of both worlds. 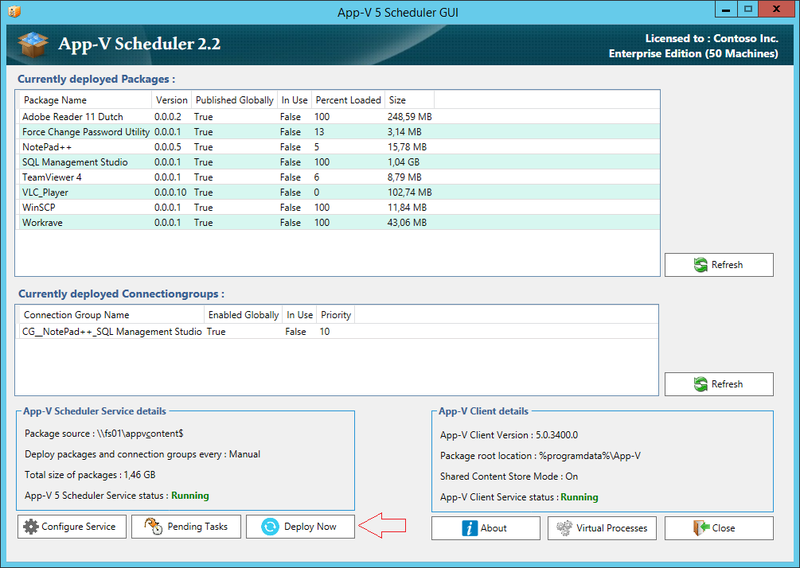 App-V Scheduler 2.2 is now available on the App-V Scheduler website. 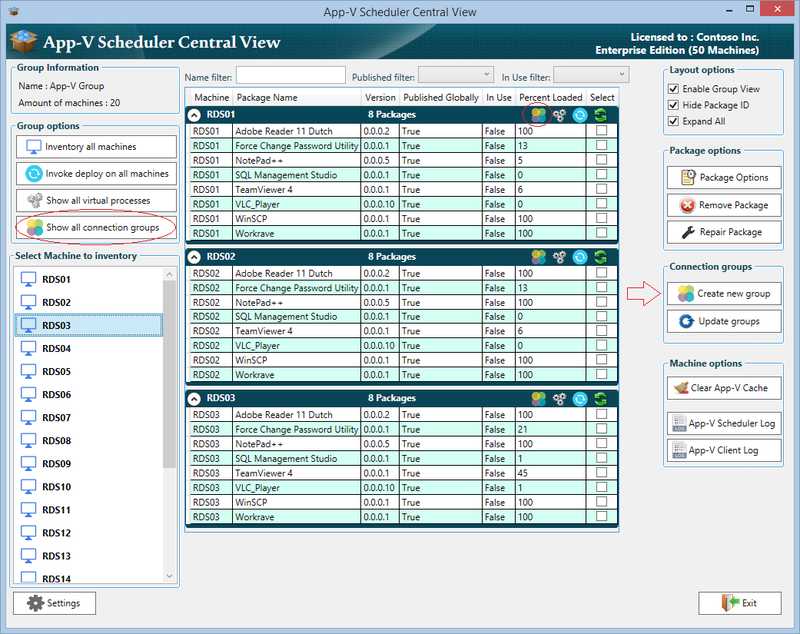 This blogpost will highlight the new features in App-V Scheduler 2.1 and the new App-V Scheduler Central View management console. 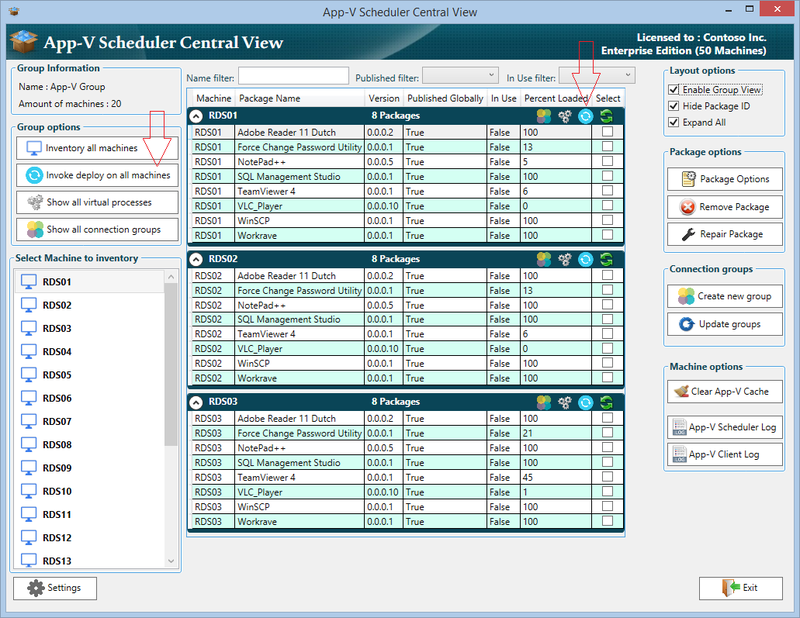 App-V Scheduler 2.1 is an update of the previously released App-V Scheduler 2.0 version, if you are reading about App-V Scheduler for the first time I would recommend to start with the previous blogpost. Big thanks for everybody providing feedback and supporting the App-V Scheduler project. Especially Kees Baggerman, Andrew Morgan and Nathan Sperry for providing valuable feedback in the last months. Suggestions and feature requests are always welcome! 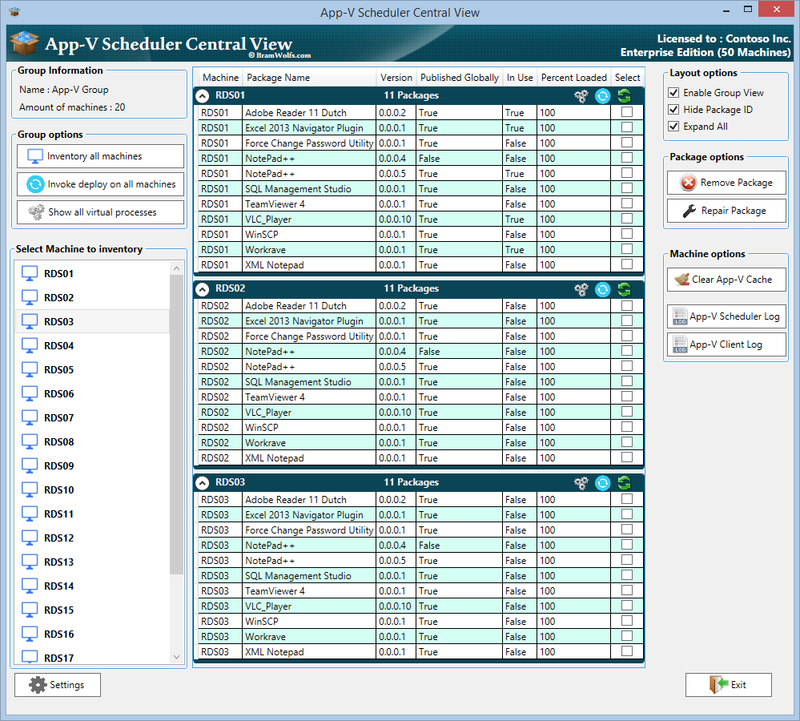 App-V Scheduler 2.1 is available on the App-V Scheduler website, you will also find the pricelist and the feature comparison there.